These printers are available with optional label cutter, label peeler bar or WiFi connectivity. The ZD500R is a thermal-transfer 203-dpi RFID label printer that can print labels up to 4.09" wide and up to 39" long. Print speeds up to 6" per second. The case is made of double-walled ABS and has auto-calibration for the media. The ZD500R is a thermal-transfer 203-dpi RFID label printer that can print labels up to 4.09" wide and up to 39" long. Print speeds up to 6" per second. The case is made of double-walled ABS and has auto-calibration for the media. Includes optional peeler bar. 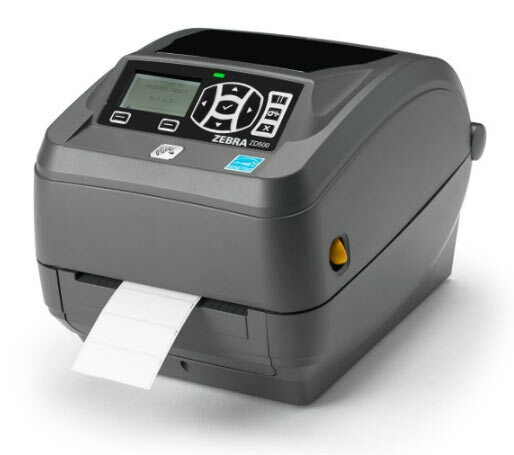 The Zebra ZD500R Label Printer - 300 DPI RFID is a thermal-transfer 300-dpi RFID label printer that can print labels up to 4.09" wide and up to 39" long. Print speeds up to 6" per second. The case is made of double-walled ABS and has auto-calibration for the media. The Zebra ZD500R Label Printer - 300 DPI RFID Peeler is a thermal-transfer 300-dpi RFID label printer that can print labels up to 4.09" wide and up to 39" long. Print speeds up to 6" per second. The case is made of double-walled ABS and has auto-calibration for the media. The ZD500R is a thermal-transfer 203-dpi RFID label printer that can print labels up to 4.09" wide and up to 39" long. Print speeds up to 6" per second. The case is made of double-walled ABS and has auto-calibration for the media. Includes optional label cutter. The ZD500R is a thermal-transfer 203-dpi RFID label printer that can print labels up to 4.09" wide and up to 39" long. Print speeds up to 6" per second. The case is made of double-walled ABS and has auto-calibration for the media. Includes optional WiFi. The ZD500R is a thermal-transfer 203-dpi RFID label printer that can print labels up to 4.09" wide and up to 39" long. Print speeds up to 6" per second. The case is made of double-walled ABS and has auto-calibration for the media. Includes optional Peeler Bar and WiFi. The Zebra ZD500R Label Printer - 300 DPI RFID Label Cutter is a thermal-transfer 300-dpi RFID label printer that can print labels up to 4.09" wide and up to 39" long. Print speeds up to 6" per second. The case is made of double-walled ABS and has auto-calibration for the media. The Zebra ZD500R Label Printer - 300 DPI RFID WiFi is a thermal-transfer 300-dpi RFID label printer that can print labels up to 4.09" wide and up to 39" long. Print speeds up to 6" per second. The case is made of double-walled ABS and has auto-calibration for the media. The Zebra ZD500R Label Printer - 300 DPI RFID WiFi Peeler is a thermal-transfer 300-dpi RFID label printer that can print labels up to 4.09" wide and up to 39" long. Print speeds up to 6" per second. The case is made of double-walled ABS and has auto-calibration for the media. The ZD500R is a thermal-transfer 203-dpi RFID label printer that can print labels up to 4.09" wide and up to 39" long. Print speeds up to 6" per second. The case is made of double-walled ABS and has auto-calibration for the media. Includes optional label cutter and WiFi. The Zebra ZD500R Label Printer - 300 DPI RFID Label Cutter WiFi is a thermal-transfer 300-dpi RFID label printer that can print labels up to 4.09" wide and up to 39" long. Print speeds up to 6" per second. The case is made of double-walled ABS and has auto-calibration for the media.